The town of Oakdale in Northern California is now home to what is thought to be the world's first single-axis solar tracking system featuring thin-film photovoltaic cells. Conergy was awarded the contract for the San Joaquin solar power project and recommended a single-axis tracking system because of its ability to generate up to 15 percent more power than the same size fixed-axis system. The town of Oakdale, California, may bill itself as the Cowboy Capital of the World, but now this community of about 20,000 between San Francisco and Yosemite National Park can put another notch in its belt. Oakdale is now home to what is believed to be the world's first single-axis solar tracking system featuring thin-film photovoltaic cells. 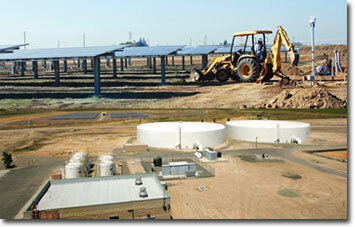 The South San Joaquin Irrigation District (SSJID) was scheduled to complete its 378-kilowatt system in February 2009. The system joins a 1-megawatt system that features monocrystalline PV panels mounted on a single-axis tracking system that went online in May 2008. Together, the systems should provide nearly all of the power the district needs to operate the adjacent state-of-the-art Nick DeGroot water treatment plant. The two systems-known collectively as the Robert O. Schultz Solar Farm-also should save the district about $400,000 annually that it would have spent buying electricity from Pacific Gas & Electric (PG&E). The project's main goal was to stabilize electrical costs, and the environmental benefits created by the solar power were a bonus, says Don Battles, SSJID utility systems director. David Vincent, Conergy project development manager for the Western United States, said SSJID has his respect for its forward thinking approach. "They want to deliver water at the lowest cost to the people in their district. They're definitely open minded, and they're willing to look at all of the options on the table and make the best decisions for the district." But nearly as important to district general manager Jeff Shields, an admitted "technology nut," is they'll be able to compare two different solar-generation technologies under the same operating conditions. "It's almost like a lab out there with the side-by-side technologies," Shields says. "This will be the first time they've had real-time live data on how they perform under the same weather conditions." The South San Joaquin Irrigation District was scheduled to complete its 378-kilowatt system in February 2009. Together with a 1-megawatt system that that went online in May 2008, the systems should provide nearly all of the power the district needs to operate the adjacent state-of-the-art Nick DeGroot water treatment plant. Founded in 1909, the Manteca, California-based South San Joaquin Irrigation District was originally established to deliver surface water to farmers near the towns of Escalon, Ripon and Manteca who cultivated more than 60,000 acres. Over the years, the district has diversified to provide treated drinking water and wholesale electricity. In the mid-1950s, it joined with the Oakdale Irrigation District in a joint venture to build the Tri-Dam Project on the middle fork of the Stanislaus River in Tuolumne County. The project involves three dams with a potential to generate about 120 megawatts in hydroelectric power and generate about $20 million annually in electricity sales revenue-from PG&E -that's shared by the two districts. In fact, the district's primary revenue source is power generation, not irrigation water sales, Battles says. In 2005, the district built the DeGroot water plant to treat water from the nearby Woodward Reservoir and deliver it to the urban areas of Manteca, Oakdale, Lathrop, Tracy and has a reservation for sales to Escalon. 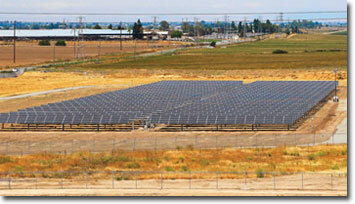 The SSJID board of directors began exploring a solar power generation farm in early 2007, Battles says. "The primary purpose of the farm was to try to offset the power costs of the water treatment plant." Initially, the board looked at a 1.9 MW facility. But after learning about the 1 MW cap on state renewable energy rebates, the project was broken into two phases and scaled back to a total production capacity of 1.4 MW, Battles says. The state also had a 1 MW limit to be eligible for the net-metering program. The first phase was built under the California Solar Initiative, which pays rebates over a five-year period based on the amount of energy produced. The second phase fell under the state's Solar Generation Incentive Program, which pays a specific amount per watt, based on the size of the project. In SSJID's case, the payment was $2.50 per watt for the 378 kW plant. In addition, the project was split because PG&E limits the amount of solar-generated power that can move through a set of inverters and transformers to 1 MW. So Battles says the project's two phases will have separate and independent sets of inverters and transformers to meet the restrictions. Because the irrigation district is a government entity, it did not qualify for the federal investment tax credit. Computer models that took into account the rebates, the amount of electricity produced and the project electricity savings showed the systems would pay for themselves in 10 years, Battles says. Once the board had decided on moving forward, the district put the project out to bid. 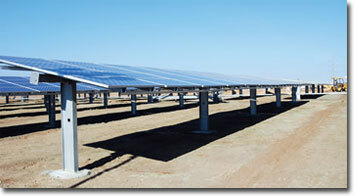 Denver, Colorado-based Conergy, formerly known as SunTechnics, was awarded the contract in early 2007. Vincent says Conergy recommended a single-axis tracking system because it can generate up to 15 percent more power than the same size fixed-axis system. Some tracking systems use an electronic eye to position the panels as it follows the sun from the eastern horizon in the morning to the west where it sets. But the SSJID system uses sophisticated computer software originally developed by the military to obtain the optimum panel positions, Vincent says. One of the drawbacks with electronic eyes can occur on cloudy days, or in the San Joaquin Valley, during foggy winter days, Vincent says. Some tracking systems use an electronic eye to position the panels as they follow the sun from the eastern horizon in the morning to the west where it sets. But the South San Joaquin system uses sophisticated computer software originally developed by the military to obtain the optimum panel positions. "You may have some of these days where it's foggy in the morning, and it finally clears up a little later in the afternoon. The eyes won't be able to find the sun, and they stay at the wrong angle for the rest of the day." That can mean lost generation potential, he says. Before sunrise, SSJID's system starts the panels at a 45-degree angle facing east. Every two to three minutes, the computer moves the panels almost an indiscernible amount. At noon, the panels are parallel to the ground. By the time the sun sets, the panels are at a 45-degree angle facing west. The computer then returns the panels to 45 degrees facing east during the night. The first phase features 6,720 monocrystalline panels from Conergy that are rated at 175 watts each. Power from the panels feeds into five 250-kW inverters. The system went online this past May and seems to be producing at or slightly above what the computer model showed, Battles says. "I think the model showed we were above it in the summer and probably tracking pretty close right now," Battles said in mid-November. Thanks to antennae on the inverters that sends power generation information to monitoring and reporting company Fat Spaniel Technologies, Battles can log onto the Web from the SSJID office 22 miles west of the solar array to see how it's performing. Through the Fat Spaniel website, he's also able to compare the 1 MW SSJID system with a 1 MW fixed-axis roof-mount system on Warmerdam Packing's fruit packinghouse in Hanford, California. "We can look at our production and their production on any given day and see how we're tracking," Battles says. "We're generally 15 to 18 percent ahead of them. In reality, Hanford probably has better sun than we do." In addition, Conergy is able to monitor the system's performance through the website. The second phase of the SSJID project involves 5,670 panels that use what Vincent describes as cutting edge thin-film technology. "Thin-film is a much more cost-effective way to generate power," he says. The second phase also will be one of the most advanced PV projects in the world since it incorporates the thin-film technology with a single-axis tracking system, Vincent says. "The big thing is the stability and quality of the tracking system," he says. "If there's too much flexibility in the design, you could see cracks or breaking of the modules." The thin-film panels on SSJID's tracking system carry the same 25-year warrantee as they would on a fixed-axis project, Vincent says. The second phase must go online on or before February 15 for the district to qualify for the state rebates, Battles says. And with the region's dry, open fall, construction was on or ahead of schedule in late 2008. As part of the turnkey services Conergy offers, nearly all of the work was performed by its own employees, Vincent says. Only a small amount of work that involved high-voltage lines was performed by outside companies. Both the first phase and eventually the second phase are hooked into the state's power grid. So any excess power not needed by the water treatment plant can be used elsewhere. During the summer when PG&E's A6 rate schedule is in effect, the district pays about 36 cents per kWh during the peak power demand period, Battles says. "But if we're producing it and going beyond our power requirements, we're selling that power into the system at 36 cents kWh. So it works out nicely for us because a lot of the production is during the peak time." The first phase cost about $7.9 million, with the second phase about $3.1 million, says John Stein, SSJID assistant general manager. Originally the district had planned to dip into its reserve to pay for part of the first phase and the entire second phase. But Stein says he recommended that the board approve a $25 million bond issue since it had distinct advantages. "If you secure your debt with property tax revenue, the state can't take that," he says. Of the $25 million, about $6.4 million will be used to reimburse the reserve for funding the solar projects, and about $18.5 million will go toward additional system upgrades throughout the district.